One of the best "monster of the week" episodes in the show's long history, there's not one note played wrong. This may well be the best episode of the series once all is said and done and the final four episodes have a high bar to clear. 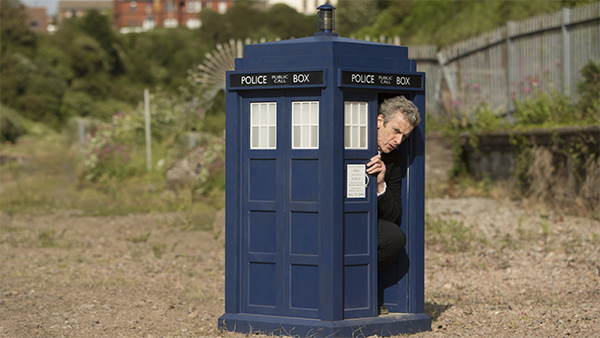 The TARDIS winds up about 100 miles away from Clara's home as The Doctor and Clara return from their latest adventure. That is not so unusual. What is unusual is that The TARDIS is slowly shrinking and people are disappearing from the local neighborhood as strange graffiti resembling the missing people is appearing on walls around town. And when The Doctor becomes stuck inside a toy-sized TARDIS, it will fall to Clara to step into the role of The Doctor as a menace from another universe touches our world! * The script by Jamie Mathieson is a perfect balance of horror, comedy and action. * The Boneless are a truly terrifying monster - not only for their instantly lethal touch but because of an alien nature that is Lovecraftian in scope. By the episode's end, we still have no idea precisely what they are or what their intentions and purpose in attacking people are. We don't even know if they realize what they are doing! * Many of the episodes this series have focused upon the relationship between The Doctor and Clara but none have done so quite so effectively as this episode. We are shown how Clara views The Doctor in her attempts to be a proxy Doctor - with much banter and snarking, of course. And it is telling indeed that The Doctor asks if that's what he really sounds like - once in a moment of offense and once in a moment of revelation. * By that same token, any doubt as to The Doctor's feelings about Clara and humanity in general and his having become nothing more than a mean old man in this incarnation are put to rest as The Doctor praises Clara's performance as The Doctor and her companion, "the florescent pudding brain" Rigsy. This Doctor may have the lowest threshold for suffering fools gladly of any Doctor in history, but he will give credit when credit is due. * Fenton, the curmudgeonly supervisor, provides an interesting contrast to The Doctor and a further denial of The Doctor being a mean old man at hearts. Here, we have a truly awful man who views people as expendable and doesn't give a damn about people dying so long as it isn't him that did the dying. And again we have the theme of The Doctor's trying to be a good man being the thing the redeems him, even as he harbors some monstrous thoughts. * As before, Capaldi and Coleman play off of each other perfectly. * It's a nice touch that, despite being inspired by The Doctor's example, Clara's plan for fighting The Boneless is her's and her's alone. As is her solution for The Doctor escaping when his powerless TARDIS falls onto a train-track with trains approaching. "I tried to talk. I want you to remember that. I tried to reach out, I tried to understand you, but I think that you understand us perfectly. And I think that you just don’t care. And I don’t know whether you are here to invade, infiltrate or just replace us. I don’t suppose it really matters now. You are monsters! That is the role you seem determined to play, so it seems that I must play mine – The man that stops the monsters!" * The only real problem with the script - and this is not a pun - is that the supporting cast are incredibly two-dimensional. Fenton exists purely to be an obstacle and a symbol of what The Doctor is not. Rigsy is the standard "hidden layers" one-off companion. Everyone else - and again, this is not a pun - is just a part of the background. An instant classic, with a great monster, witty dialogue and a perfect balance of horror and humor. This may be the new Blink - the episode for introducing complete newbies to Doctor Who.